It won't matter which team you're rooting for - everyone wins when they get to enjoy a piece of the playing field! Prepare cake batter and bake as directed on package for 13x9-inch pan, lining pan with foil sprayed with cooking spray before adding batter. Cool cake in pan 15 min. Remove from pan to wire rack; cool cake completely. Place on platter. Tint 2 cups Cool Whip with food colouring; spread onto top and sides of cake. Spoon remaining Cool Whip into resealable bag. 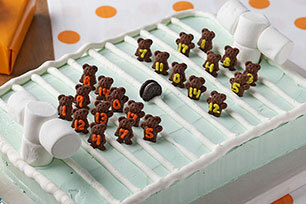 Cut off small piece from bottom corner of bag; use to outline football field on top of cake. Add yard lines with remaining Cool Whip. Add Teddy Grahams for the football players and the Oreo Cookie for the football. Thread marshmallows onto toothpicks; use to make a goal post as shown in photo. Add to top of cake. Keep cake refrigerated. Decorate the Teddy Grahams with 2 different colours of decorating gel for the colours of the opposing teams. Dessert can be part of a balanced diet, but remember to keep tabs on portions.